In a recent post about isotopic abundance, I used a prototypical image of a lithium atom to illustrate the basic structure of an atom. However, the image was deliberately not drawn to scale to make the protons, neutrons, and electrons visible. Let’s look at the basic composition of the atom to see why, and we owe this understanding to Ernest Rutherford. First, let’s give some historical background about what motivated Rutherford to conduct this experiment; we first turn to the Plum Pudding Model by J.J. Thomson. Before 1911, the dominant theory of atomic composition was J.J. Thomson‘s “plum pudding” model. 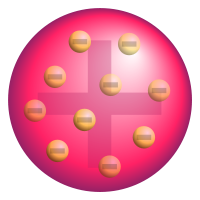 Thomson hypothesized that an atom consisted of electrons as negatively charged particles (the “plums”) “floating” in a “pudding” of positive charge.